The spine-tingling excitement of Match Day, when students at the Boonshoft School of Medicine learn where they are heading as new doctors in residency programs. And Wright State twice hosting the Science Olympiad National Tournament, a team effort that showcased the science and engineering talents of thousands of middle- and high school students from around the globe. These were among the inspirational stories and points of pride that bubbled to the surface during the latest community dialogue session in the university’s strategic planning process. More than 90 staff, students, faculty and alumni attended the Feb. 27 session in the Student Success Center on the Dayton Campus. 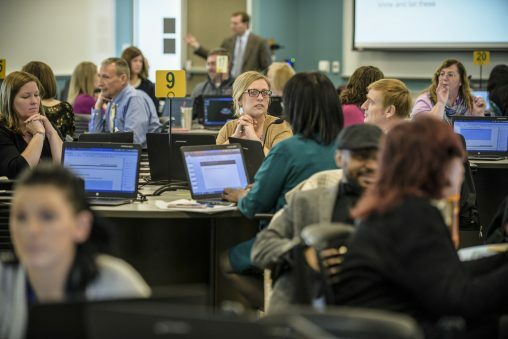 Amanda Spencer, director of university academic advising, said the session left her optimistic, energized and inspired to help take Wright State to an even higher level. 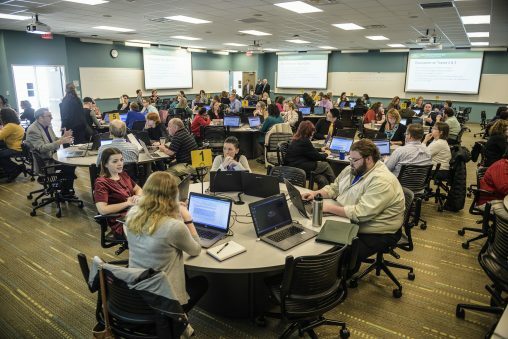 “It was good to hear a lot of positive things about Wright State – the good place that it is and the potential that it has, kind of looking forward rather than looking back,” added Brian Boyd, associate professor of mathematics education. Nearly 100 members of the Wright State University community participated in the Feb. 27 Strategic Planning Community Dialogue. The community dialogue session will help refine the university’s vision, mission and values statements as part of the ongoing strategic planning process, The Wright Path to 2025: Pride, Transformation, Potential. The process is intended to start an ongoing dialogue among the campus community that encourages continuous reflection and revision of the community’s hopes and priorities. During the session, the participants were asked to discuss at their tables the university’s strengths and values and to share “peak moments” in their Wright State experience. Sara Woodhull, director of development in the College of Liberal Arts, mentioned Raidersgiving, which has grown from serving Thanksgiving meals to 22 students in 2012 to 500 students last year. Seth Gordon, director of Wright State’s Veteran and Military Center, was inspired by the discussion at his table about Match Day and the medical students. Participants shared their peak moments at Wright State and the values they hold most dear. Wright State values mentioned at the session by participants included professionalism, perseverance, leadership, transparency and a passion to help others succeed. Strengths included trust, creativity, collaboration, international education, research, study-abroad programs, openness to new ideas, personal service to students, willingness to address and fix problems, giving students a voice and resources for staff/student development. Participants said they would like to see an even greater emphasis in the future on campus life, opportunities outside the classroom, experiential learning, retention and graduation of non-traditional students, developing strong leaders among faculty and staff, staying on the cutting edge of teaching technology and raising the profile of Wright State’s accomplishments in the region and country. Wright State President Cheryl B. Schrader told the gathering she was impressed by the passion and commitment in the discussions. “I am inspired by all of you and what we can do together,” she said. The Strategic Planning Steering Committee is guiding the university’s efforts to include a wide range of perspectives from the Wright State family and the broader community. The committee includes 33 Wright State employees, students and alumni as well as community leaders. It is co-chaired by Schrader, David Bright, chair of the Department of Management and International Business, and Michael Wiehe, director of the Applied Policy Research Institute. The first phase of the planning process is focused on gathering community input to develop an updated vision, mission and values statement for Wright State. In April, the committee will host an event to unveil the updated vision, mission and values statement and a draft strategy statement. From May through September, the committee will use what it learns from its outreach efforts in the spring semester to further develop strategy statements, priorities and goals, as well as metrics to measure the effectiveness of the strategies. The goal is to deliver a strategic plan to the Board of Trustees by October 2018 for its approval. Participants are asked to register for each dialogue session. Details and registration information can be found on the strategic planning website. Monday, March 5, 1 to 3 p.m.
Friday, March 9, 3 to 5 p.m. Registration is required for these sessions. Participants will need a strong, reliable broadband connection, a microphone and speakers/headset. Google Chrome is the preferred browser. You can stay up to date with the planning process by visiting wright.edu/strategicplan.